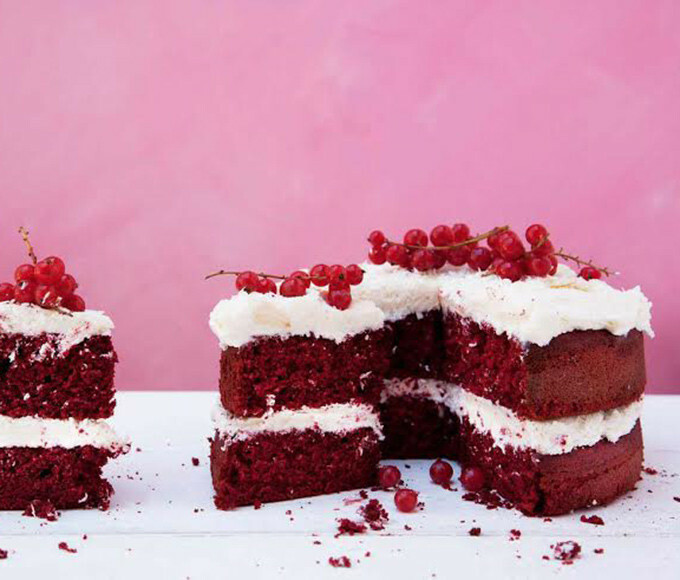 Make your own anti Valentine’s bleeding heart cake for your sweetheart – click here for a how to video featuring Rosie Birkett too. First, make your coulis. Place all the ingredients in a medium-sized heavy-bottomed pan and bring to the boil over a gentle heat, stirring continuously. Reduce to a simmer and heat for 15 minutes, or until thickened. Allow to cool. For each bleeding heart, take 75g of fondant icing and roll it into an oval shape about 0.5cm thick, roughly 20 x 10cm (a small silicone rolling pin and mat will help to stop it sticking, otherwise use icing sugar). Place one of the cupcakes in the centre of the oval and pipe a little bit of buttercream or frosting to stick it in place. Wrap the fondant around the cake from both the edges, folding inwards to the front of the cake, then fold in the bottom, cutting away any excess and use the extra fondant at the top to form the arteries. 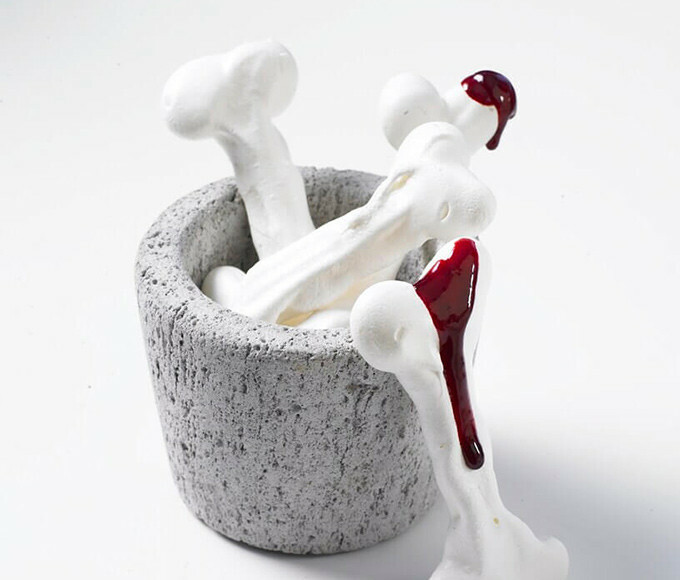 Don’t worry about any creases or gathering in the fondant – they make for useful gory details later on. In a small bowl, mix a spoonful of the clear piping gel with some drops of red (and black if you like) food colouring. Now paint the fondant heart all over using a soft brush – it will stay really glossy. 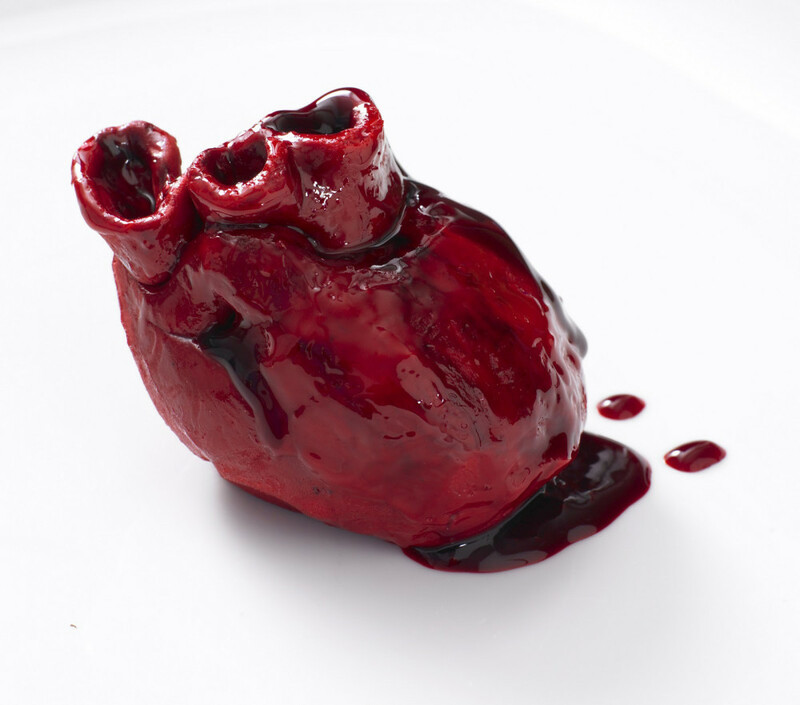 When you are ready to serve, use a pipette or spoon to add coulis ‘blood’ to the arteries and in a puddle around the base and prepare to eat your heart out.